inPhoto ID Webcam works as TWAIN driver. It can be used with all commom ID card design and management software for automatic image capture with a web camera, face recognition, crop, image resizing and enhancement, and image transfer to the photo field of an ID card design and management software e.g. Incardex software for ID card design and print. 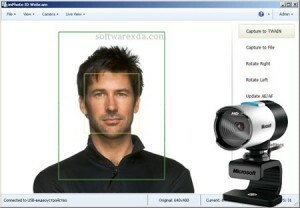 InPhoto ID Webcam also works as standalone software providing an ability to capture and save ID images to file.